Osteoarthritis affects predominately joint cartilage, the smooth glistening surface that lines the bone within the joint. The function of the cartilage is to provide shock absorbency and reduce friction as the joint glides. Osteoarthritis produces thinning and damage to the cartilage, which will break down becoming rough and eroded. Inflammation results in the development of bony ridges and spurs, which may progressively enlarge. Cartilage and bone are further damaged as the bones rub together and deformity results when one side of the joint collapses more than the other side. When the cartilage loss is great, there may be severe pain in the involved joint with use or even at rest. Osteoarthritis most frequently occurs in the knees, hips, ankles, hands and other weight-bearing joints. In cases of osteoarthritis of the knee, the actual appearance of the knee may change over time. Some people may become knock-kneed or bow-legged. If you don't move the affected joint, muscles surrounding the joint will become weaker and sometimes shrink. In osteoarthritis of the hip, the pain may cause you to limp. Also, you may feel pain around the groin or inner thigh. The affected leg may appear shorter in cases of osteoarthritis of the hip. Putting on your shoes and tying the laces become difficult. In the fingers, the breakdown of cartilage causes bone spurs in these joints. Spurs in the end joints of fingers are called Heberden's nodes, which occur most often in women and sometimes as early as 40. Spurs in the middle joints of the fingers are called Bouchard's nodes. Your doctor will determine what type of arthritis you have. He or she will ask you about your symptoms and any related illnesses. It will be important for you to tell the physician about where, when and how long you have had pain. Also tell the physician whether there is any swelling or redness in the involved joints and if there is any history of arthritis in your family. The doctor will perform a careful examination of your joints to determine if there is any swelling, redness, tenderness or loss of motion. X-rays will allow the doctor to see inside your joints and determine if there has been any destruction of cartilage with narrowing of the normal joint space or wear and tear on the bones. Blood tests may also be of value in differentiating rheumatoid arthritis from osteoarthritis and other types of arthritis. Regardless of the type of arthritis that a person has, many patients will experience some difficulty functioning at home, at work or at play because of joint pain, stiffness, and loss of motion. Arising from bed in the morning, buttoning buttons, writing, sewing, meal preparation, dressing, sleeping, walking, climbing stairs, arising from a chair or a toilet seat, and attending to matters of personal hygiene may all be impaired to some degree by arthritis. Oftentimes, impairment of function is more distressing to patients than the pain of arthritis and a major goal of all arthritis treatment is the preservation or improvement of function. Several general principles for living with arthritis should be mentioned. Weight control - with diet and appropriate exercise - is extremely important to decrease the stress on the arthritic joints. Exercise in particular, is an important part of any therapy prescribed for patients with arthritis. Range of motion exercises and strengthening exercises are important to maintain or improve joint mobility and to increase the strength of the muscles around the joints and minimize the stress on those joints. Aerobic exercise, such as walking or riding a stationary bike helps to decrease fatigue, improve cardiovascular health, and create a sense of well being. These aerobic exercises may be difficult for those patients who have pain in their hips, knees and feet. A water exercise program or protocol specifically designed for comfortable movement by a physical therapist may be more tolerable for those individuals. Your doctor may ask you to be evaluated by an occupational therapist to make splints for joints that are swollen, painful or becoming affected by arthritis. He or she can also instruct you in easier ways to perform activities in order to minimize stress on joints, pain or fatigue. Recommendations may be given for adaptive equipment, which will make the work of certain activities less stressful. Jar openers, modified writing and kitchen utensils, and special shoehorns are examples of devices that can be beneficial for patients with arthritis. The use of special shoes, braces and walking aids such as canes, crutches or walkers may also favorably affect a patient's ability to remain functionally independent. 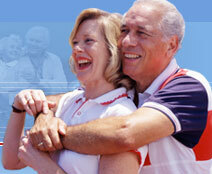 Several other measures are available for the relief of joint pain and stiffness. Many patients shower in the morning in order to lessen the duration of their morning stiffness. After showering, when the muscles are warm, it is easier to carryout stretching and range of motion exercises. The local application of heat or cold packs is also helpful for pain control. Medications may help with the pain and inflammation of arthritis and treatment usually begins with milder drugs that have the fewest side effects. Over-the-counter medications such as acetaminophen, ibuprofen, and aspirin can all be used as necessary or on a regular basis to control joint pain. When over-the-counter pain medications fail to adequately control symptoms, your doctor may prescribe anti-inflammatory medicines, referred to as nonsteroidal anti-inflammatory drugs or NSAIDS, because they attempt to control inflammation without the use of cortisone compounds. These drugs are used for treating both rheumatoid and osteoarthritis as well as other types of arthritis. Although these anti-inflammatory drugs have not been shown to be more effective than high-dose aspirin (12 or so per day), they are generally easier and safer to use than aspirin. Depending on the particular drug, they may be taken once to four times a day. These medications are more expensive than aspirin and have potential serious side effects including high blood pressure, fluid retention, easy bruising, kidney and liver abnormalities, gastritis, and stomach and intestinal ulcers. A new class of NSAIDs known as Cox-2 inhibitors are effective in the management of arthritic conditions and appear to be less likely to produce gastrointestinal problems. Depending on your age and other medical conditions, your doctor will monitor you periodically with blood tests in order to check for the potential development of side effects from the medications that you are taking. Surgery may also be helpful for patients with arthritis. Nerves and tendons compressed by inflammation within closed spaces can be decompressed. Chronic, destructive synovium can be surgically removed with the hope of slowing the progression of the disease at specific sites. Tendon transfers may restore function when tendons have ruptured over arthritic spurs. Procedures can be done to change the weight distribution to a partially arthritic joint so that the good, remaining cartilage can bear more of the load. Deformed or unstable joints may be fused (joined into a single bone without a joint.) Soft tissue procedures or a combination of bone and joint removal and soft tissue reconstruction, can be carried out to stabilize joints, relieve pain and preserve motion. And finally, technology now exists to replace many arthritic joints with new articulating metal and plastic components that can help restore motion: improvement in function and lifestyle may result from procedures such as total hip replacement, total knee replacement, total shoulder replacement, total elbow replacement, total wrist replacement, total ankle replacement, and the replacement of deformed metacarpophalangeal or proximal interphalangeal finger joints with flexible implants. There are many important considerations for "living with arthritis." Successful treatment involves exercise, rest, the maintenance of ideal body weight, the local application of heat or cold, medication, and surgery. A positive mental outlook and the support of friends and family members is essential in minimizing the effect of arthritis upon a patient's well-being and ability to perform daily activities. Each patient will have to adapt to his or her own abilities and limitations plus remain committed and optimistic about the ability to manage his or her arthritis through good medical, surgical and rehabilitative care.